Twenty-eight years ago, Washington State University paid $2.8 million for vacant land on the eastern edge of downtown Spokane. That land has since become WSU’s health sciences campus and a key piece of the school’s effort to become one of the top 25 research universities in the nation. WSU is in the early stages of its “Drive to 25” campaign, which aims to have the university ranked among the top 25 public research universities by 2030. To measure that, they’re tracking WSU’s performance in 11 areas, including research spending, federal research grants, postdoctoral appointees and faculty awards. The campaign comes as the Spokane campus is expanding its own research efforts, thanks in part to the Elson S. Floyd College of Medicine, which has attracted new faculty and netted $10 million in research grants this year. DeWald and John Roll, the medical school’s vice dean for research, want to build links between the Spokane and Pullman campuses, allowing for research between disciplines such as veterinary and human medicine. They’re also exploring collaborative degree programs where students can receive master’s degrees in Pullman, then finish their doctoral degree dissertation work with researchers in Spokane, Roll said. “It’s not just the medical school, but it’s the type of research and scholarship we can get into because we have a medical school as part of the WSU community,” said WSU President Kirk Schulz. The push to increase research and academic performance comes at a tough time for WSU, however. The university is in the midst of a $30 million budget deficit, which has led to across-the-board cuts for academic departments and the elimination of the university’s performing arts program. Faculty have criticized those cuts, saying administrators should foot part of the bill through cuts to their own salaries. And lavish spending on the university’s football program, including a new $20 million, five-year contract for head coach Mike Leach, also has been a flashpoint. Though much of the program’s costs are paid for through private donations to the Cougar Athletic Fund, some faculty said it feels like sports are a bigger priority for the university than research. “We’ve been promoting athletics at the expense of academics,” said Donna Potts, professor of English and a member of WSU’s faculty senate. She said faculty at a senate meeting Thursday were supportive of the Drive to 25 campaign’s goals, but worried whether the university would actually be able to make the investments needed to achieve them. Overall federal research and development spending fell 10 percent in the last decade, according to data gathered by the American Association for the Advancement of Science. Spending on nondefense research decreased 17 percent in the same period. Schulz said those were fair concerns and acknowledged the budget cutbacks have slowed progress on some drives to expand research. The university will launch a $1.5 billion fundraising campaign in summer 2019 that will focus on Drive to 25 goals, including faculty hiring and student success initiatives. WSU’s endowment is valued at $494 million, with about $1.6 million of that dedicated directly to the College of Medicine. Growing endowment assets is one of the 11 goals the university has set for the campaign. “Some of our faculty, staff and students have also said, ‘How are we going to do this in an era of reduced resources where we’re cutting back?’ ” Schulz said. “It’s incumbent on the leadership of the university” to communicate within the university and address those concerns. One of WSU’s metrics is increasing federal research funding, something Schulz knows is ambitious in the current climate. “You can’t win a race if you don’t even enter it,” he said. But the university also hopes to expand public-private partnerships to drive research in both Pullman and Spokane. Schulz said the university is exploring a formal research partnership with Pacific Northwest National Laboratories. 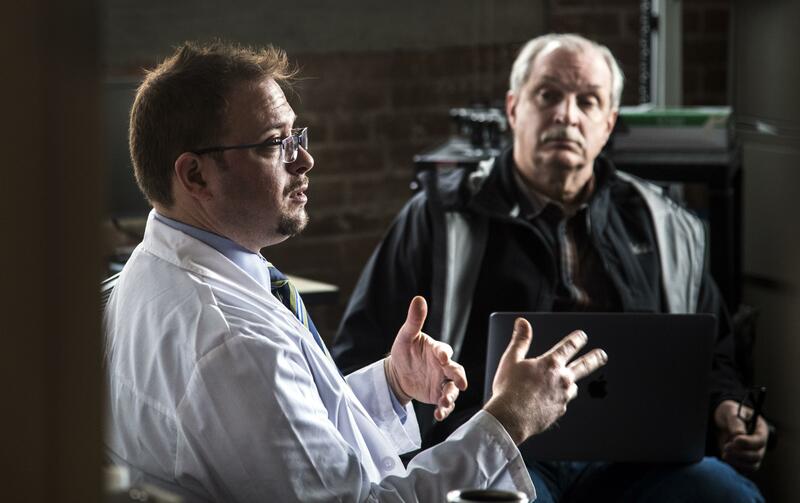 Working with private companies can give researchers access to funding they otherwise would not have, supporting more research positions at WSU, said Sterling McPherson, director of biostatistics and clinical trial design at the College of Medicine. McPherson is working on several projects with Ringful Health, an Austin, Texas-based digital health startup. Currently, he’s developing a digital tool to help health providers assess symptoms of drug withdrawal in babies. The condition, which health providers call “neonatal abstinence syndrome,” affects babies exposed to drugs in utero. Nationally, their numbers have climbed thanks to the opioid epidemic, as more kids are born to parents either using heroin or taking medication like methadone to treat opioid addiction. It’s especially an issue in rural areas. But medical staff have varying degrees of training in assessing the syndrome, which has 21 symptoms, some of which are subjective. “Because it varies so much, that produces inconsistent treatment strategies,” McPherson said. The tool he’s working on would be a digital refresher course, helping health providers evaluate symptoms in babies using standard guidelines. Once it’s done, Ringful hopes to roll it out nationwide, said Chief Operating Officer Kim Johnson. Thanks to the partnership with WSU, the company has opened a small Spokane office with three staff, he said. The work is funded by a small-business innovation research grant through the National Institutes of Health, which pays part of McPherson’s and his team’s salaries. The grant itself requires a small business, so it’s funding WSU couldn’t have accessed without a partnership. In other cases, a private company may directly fund research. Greg Belenky, a founding professor of the university’s Sleep and Performance Research Center, has done research funded by United Airlines about how to assess performance for pilots on long-haul flights of more than 16 hours. Private-sector partnerships have been controversial at the College of Agricultural, Human and Natural Resources Sciences. The Daily Evergreen, the WSU student newspaper, reported faculty have said financial pressures and business interests led private industry to punish researchers who weren’t delivering the results they wanted. Chris Coppin, the College of Medicine’s chief business development officer, said partnerships at WSU come with clear expectations spelled out in a contract that researchers are free to publish results, even if they go against what the private partner was hoping for. “It’s important and it helps remind the research partner that academic freedom at this university and all universities is really sacrosanct,” he said. McPherson said some professors balk at the idea of private funding playing a role in decisions about what to research. But he views projects like the ones he works on as a way to ensure the work he’s doing meets needs in health care. “I think that the controversy is more of a cultural phenomenon than a real risk to the integrity of research,” he said. The College of Medicine isn’t immune from budget pressure, and hiring for some research positions has been pushed back to meet spending targets. But the medical school is expanding, planning to increase its current class size of 60 students to 80 by 2019 and encourage those students to bring research ideas back to campus from their work in clinics in the community.